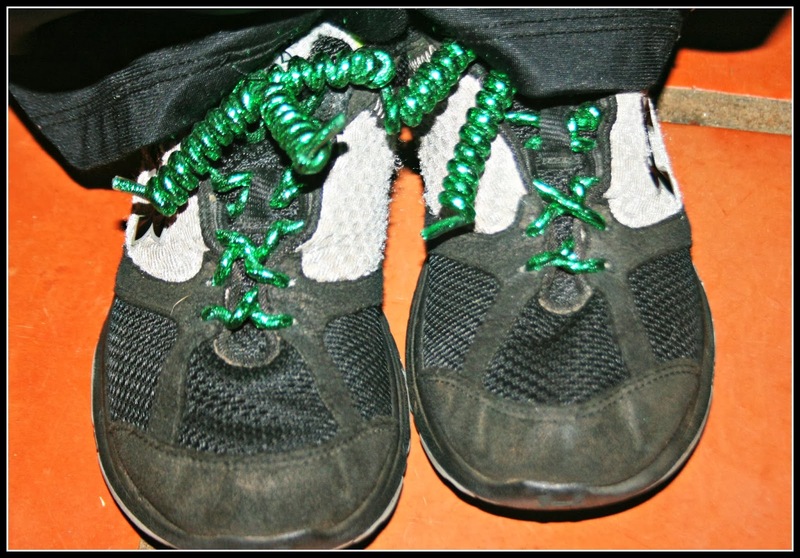 Pierce's school recently did a fundraiser for these shoe laces called Y Ties. We received some comics about them, and Pierce went on and on about how he needed a pair. Particularly after some of the other kids in school started to get them. I decided he could use some of his Christmas money to buy a pair for himself (they are $5 a pair). They had a wide assortment of colors. He chose a brilliant sparkling green. Pierce has known how to tie his shoes for a couple of years, but with these shoelaces, he just twists them instead of tying. Sometimes it's funny, the things kids get excited about. Readers, got any sparkles on your shoes lately? Love the bright green that he chose. I had a pair of those many years ago and they are handy! The thing my daughter does is to wear mismatched socks for some reason. I guess it makes sorting her laundry easier. She had special laces back in elementary school but they weren't as flashy as those. het is toch geweldig mooi voor de kids. No sparkles here, but I know my grandchildren would love those laces too! I should get these for my sons. They refuse to untie and retie shoes and wreck them by jamming their feet into them. Those seem really cool and no I do not have any sparkle on my shoes! It's always fun to see the latest fads. Cute! I've been wearing warm house slippers for a month now. Past ready for summer and sparkles and painted toenails! Those are fancy laces, very chic and they'd also be good for people with arthritis too! Oh my goodness, the cutest laces! No sparkles but I'm definitely down with the green! Those are such a cool pair! I wish I could get H to tie her own shoes! Neat ones. I've never seen them--but I do remember all of the fads popular all through the years... This is one that the kids will enjoy!!! AND--someone is making some money selling them. my mommy would like a pair- just because! They are very cool looking! Pretty cool! Kinda like diamonds on the soles of your shoes! Reminds me of a few fads we had at that age too. That's cute! I like the color he picked out! My kids just got done with a fundraiser to collect pennies to go towards March of Dimes. They were excited to get pennies from Travis, my parents and I.